Nearly 13 million children live in food insecure households and they rely on their schools to receive at least one substantial meal a day. Although there are free lunch and reduced lunch programs, many families are just above the cut off line and are still unable to afford school lunch due to other financial burdens which are not accounted for. In fact, just under half of all public school students do not qualify for assistance despite many desperately needing it. We know that the current school lunch assistance system isn't working because 76% of school districts in America have school lunch debt, which in some instances is in the millions. When a child’s lunch account goes a certain amount in debt, in an attempt to get families to pay off the school, half of all school districts allow administrators to shame the child. Children have been stamped with waterproof stamps that visibly read “I need lunch money”, forced to clean tables, and sent to detention for not being able to afford a school meal. If they attempt to get a hot meal, cafeteria workers can throw away the tray of food in front of the child and the rest of the lunch line and replace it with the bare federal nutritional minimum, which can just be a slice of bread and cheese. The different meals mixed with the school administrations singling out of a child, demonstrate to the child's peers that it is okay to bully and single out that child for those same reasons. Recently, due to overwhelming media attention, New Mexico has banned school lunch shaming and Congress has introduced a bill to end severe school lunch shaming for students who currently participate in subsidized school lunch programs. But for the millions of students who don't qualify for subsidized programs, they will still be vulnerable to this school sanctioned bullying. 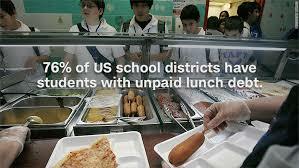 As of yet, there are not a lot of opportunities for people to learn about or help with school lunch debt. While it is not a problem that can easily be fixed, we hope that our platform will at least keep school lunch debt from increasing and raise awareness for lunch shaming. A proper lunch is essential for students to learn and grow to their full potential at school and whether or not they are getting lunch one day should never have to cross a student’s mind.